Top Shelf Classic Lager Scores Big! Less than two months after its launch, Top Shelf Classic Lager is scoring big across Ontario and generating solid royalties for the NHL Alumni Association. 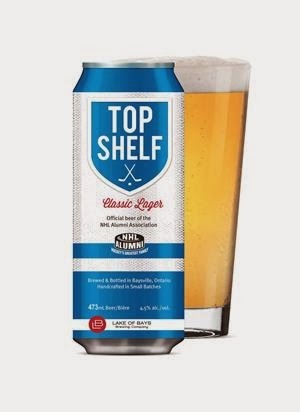 Top Shelf Classic Lager is the first beer released after the NHLAA inked a partnership with Lake of Bays Brewing Company in June to produce a family of hockey-themed beers. A North American-style lager craft brewed in Baysville, Top Shelf is has since its release in October 8 arrived on the shelves and in the fridges of more than 360 LCBOs and 40 pubs and restaurants across the province and in several US states. A portion of sales goes to support the activities of the NHLAA. “First and foremost, this is a great beer," said Darren Smith, President and CEO of Baysville, ON-based Lake of Bays Brewing Company, "and we are extremely pleased, though not surprised, with the reception it's received." "It's been a terrific experience participating in the creation of Top Shelf," said Mark Napier, Executive Director of the NHLAA, which helps former players transition to life after hockey and raises millions of dollars per year for a variety of charities. "The way it tastes, the logo, the packaging, Top Shelf says hockey. And that's just what we wanted. We are looking forward to its continued success." The duo have plans to distribute Top Shelf to other Canadian provinces and into more US markets before the year is out. A number of other endorsed beer brands are also in the works under the Signature Series category, starting with China Wall - Johnny Bower Vienna Dark Lager, set for release in early December.